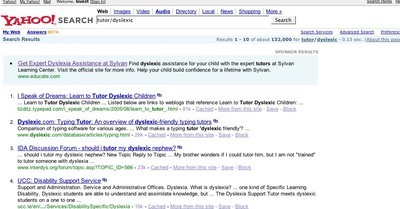 Sylvan is claiming that they can provide expert dyslexia assistance. Most of the experts say that Sylvan (as well as the other general learning centers) totally lack the resources to address dyslexic students' needs. The reading, spelling, and writing skills of someone with dyslexia can improve dramatically -- but only with the right kind of tutoring: one-on-one tutoring by someone certified in an Orton Gillingham based system. Most Sylvan Learning Centers do not offer this type of tutoring. Nor do most of the other commercial tutoring centers. A general learning center may offer you more flexibility than an individual tutor. ...That's the good news. The bad news is that tutors in centers aren't usually qualified in special needs. They don't have training in remedial reading techniques, like Orton Gillingham, and they may not know much about dyslexia. Erica Rassmussen Jane's Article, 10 Things Your Child's Tutoring Program Won't Tell you. Thanks for posting this. It's of interest not only to parents of dyslexic children but also to people interested in issues of outsourcing education--such as universities' doing away with remediation, expecting community colleges to take care of that; or colleges' outsourcing their tutoring to propriety organizations of Sylvan's ilk. i am the european representative for the learning breakthrough programme. i have used the programme to help myself and i envity you all to visit the web site and research the programme for your selves. I've always wondered about the Sylvan Learning Center. I'll probably have to find out for myself how good they are. For whose who are interested in learning more about Orton-Gillingham, here's a good introductory article.